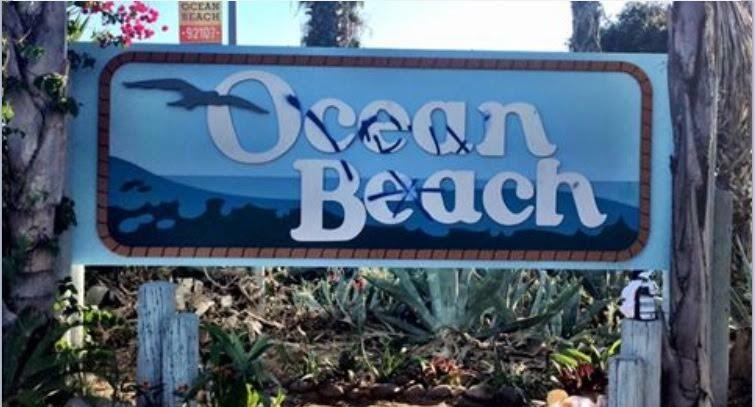 Same week that Ocean Beach locals have been preparing to defend the OB Community Plan at the California Coastal Commission meeting on Thursday — the iconic Ocean Beach entry way sign was seriously vandalized late Sunday night – August 9th or early Monday morning. OB Town Council President Gretchen Newsom has tackled the issue full throttle. And no doubt, she will fight for the Community Plan just as hard. Newsom herself and a team of volunteers went down to clean up the sign themselves. Major kudos to a woman who fights for all issues in OB every day, seven days a week, day and night. And this woman doesn’t sit around waiting for someone else to do the cleanup. She took part in the cleanup with her own two hands. Here are before and after photos, to date. Some cleanup remains to be done. All photos taken by Gretchen Newsom. I hope this scum gets caught & busted. Just heard a few minutes ago that this has been completely painted over, and looks like new. Everyone should give Town Council Prez Gretchen Newsom a high-five or buy her a beer or both for taking care of this so quickly and efficiently. 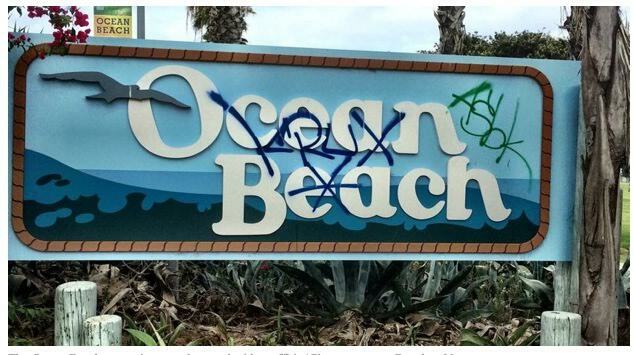 Gretchen Newson should head the OBCDC also and I bet the entryway would cleaned and dolled up. Or at least the OBCDC should transfer the entryway to OBTC for maintenance etc. Some people are take charge and Gretchen appears to be one of them. Thank you.